Home → Landscaping Tips → How Often Should I Water My Lawn? Watering infrequently and deeply will encourage deeper root development. Watering a minimum of 1 inch weekly during the early morning is best to ensure the grass doesn’t stay wet for an extended period of time, this discourages the development of disease. Measure rainfall and sprinkler water with a rain gauge or a coffee can or a tuna can. High spots and south-facing slopes will need more water than other areas. Apply less water in shady areas that receive less than 4 hours of direct sunlight daily. Grass under large trees will need more water since the tree roots will consume water and the tree canopy may intercept rainfall. Your lawn may become brown during hot, dry spells. It’s in a dormant state and will green up again when wetter, cooler weather returns. A healthy lawn can survive several weeks in a dormant state. 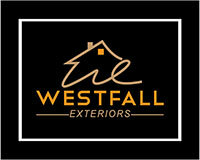 If you're planning an outdoor project, contact Westfall Exteriors today. We're currently taking bookings for the 2018 - 2019 Snow Removal season. We are looking forward to being your outdoor services contractor.